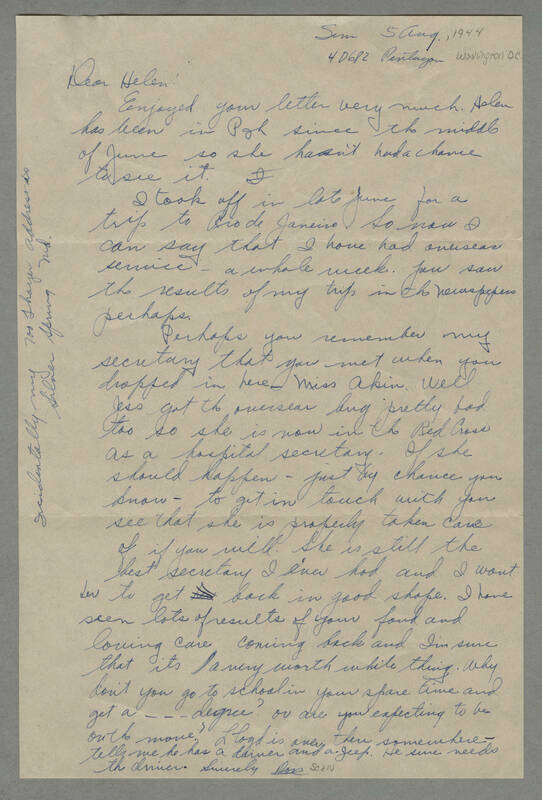 Sun, 5 Aug, 1944 4D682 Pentagon Washington, D.C. Dear Helen: Enjoyed your letter very much. Helen has been in Pgh since the middle of June so she hasn't had a chance to see it. I took off in late June for a trip to Rio de Janeiro. So now I can say that I have had overseas service - a whole week. You saw the results of my trip in the newspapers perhaps. Perhaps you remember my secretary that you met when you dropped in here - Miss Akin. Well Jess got the overseas bug pretty bad too so she is now in the Red Cross as a hospital secretary. If she should happen - just by chance you know - to get in touch with you see that she is properly taken care of if you will. She is still the best secretary I ever had and I want her to get back in good shape. I have seen lots of results of your fond and loving care coming back and I'm sure that its a very worth while thing. Why don't you go to school in your spare time and get a ---- degree? or are you expecting to be on the move? Lloyd is over there somewhere - tells me he has a driver and a Jeep. He sure needs the driver. Sincerely, Don Scan Incidentally my address is 700 Thayer Silver Spring Md.